It’s been almost 2 months since i got back from Korea. So when i met my friends , all of the asked the SAME question. Haha i can’t remember how many times have i answered this question and i just remember answering ” It’s good” and only for close friends do i go into details. All was positive and nothing negative. His mother said that she wants to exercise and live longer after seeing both Oppa and i together. So it is a very good sign. I realized both Oppa’s mother and i have alot of things in common. Like how we like to “pull” the door again after locking it to make sure that we really locked it . Sometimes when we were in a rush , we may think that we forgot to lock the door so we go up and check again. And we don’t “trust” the men when it comes to housework. Like how they said they will wash but we know they don’t and we will do it instead. And one thing we had in common which we really talked and share with each other happily. Yes..skin care. Omoni and i are really into skincare and we have the same habit. We stock up alot , we put on mask packs or masks everyday , we check out the latest and best skin care products in the market. Her make up and skin care hoarding is worst than mine. But i enjoy going through her stock ups of skin care and make up. I received requests for more product reviews. But because i only buy products which i use and think that it is good , so i can only review or blog them when i got it tried and tested to be good enough to be recommended. There are some new products which i want to buy in my next trip to Korea. I used to buy and buy and buy and ended up , i can’t finish using all of them and it was such as waste because once opened , i must use them within 12 months ! I used to have sooo many serums , sooo many moisturizers etc on my desk. Ok , so both of us love skincare and love hoarding skin care products and make up products. Sometimes i felt like i can “shop” at Omoni’s house. Because there are so many products to try and use. Here’s one of the facial masks Omoni gave me. She let me try 2 pieces when i was sick and bedridden in Korea and i love it. So she called in a Home Shopping hotline ( can’t remember if it was CJmall , Hyundai mall or Lotte ) and ordered a big box ( over 100 pcs ) for me and my bf. Damn fast..call in the morning and arrive the next morning. Cel-Derma is a well known brand for its facial masks and anti-aging products. 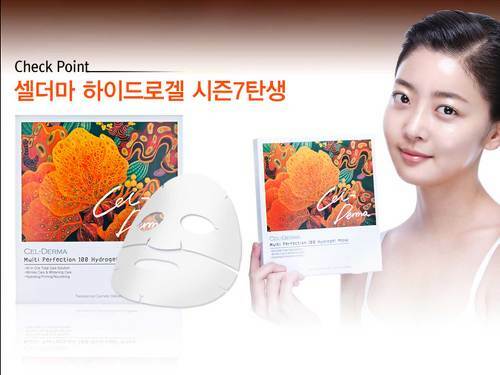 This gel mask comes in 2 sheets ( upper part and lower part of the face ). It is gel-like texture. Ehh..sorry no pictures of the mask after it was taken out because im quite particular when i put on masks. I make sure my hands are clean and i don’t want to touch the camera and when i put on the mask , i will lie down and relax. Maybe next time i shall ask oppa to take a picture for me when i put on the masks. Also , im using Cel-Derma eye patch gel. I like it alot and it does help to hydrate my skin. On days when i feel really tired , i will put on the eye gel patch followed by Hera Waterin Eye Roll-On Gel before putting on my make up. It helps my concealer to set properly and not cakey. I really like this eye mask and the one from Mediheal which im also currently using ( and will blog about it probably next week ..too many products and lost track which one i have blogged about and which one i have not ) . 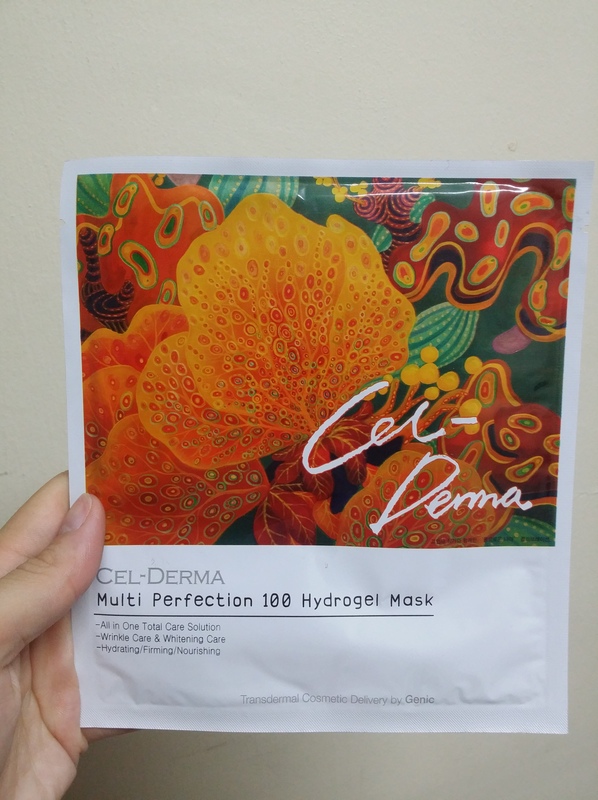 Yes , so if you are looking for hydro-gel masks , you can consider Cel-Derma. Oppa’s mum recommended this because it is affordable and it hydrates your skin. She is really cute.. because she will message us to remind us to put on the masks, always encourage and reminds us to take good care of our skin. She even asked me to remind my bf to do it too lol..because she knows that boys doesn’t know much about skincare. I really like this gel mask because it does helps to hydrate and brighten my skin. I think one box is about KRW 19,900. I used to use Missha masks everyday and im still using them but i mix in with other brands because im getting older and have other skin concerns. Im gonna start using those collagen and lifting/tightening products and this coming trip to Korea , im gonna get all of them there. Im gonna get collagen creams , ampoules , hyaluronic serums and many more. I wont review the brands now till i bought it and tried it myself. I want to start taking care of my skin early and probably gonna start anti-aging products when im 32years old. So now , just start on collagen , lifting and tightening products ( creams , ampoules and masks ). But im still sticking to hydrating toners and serums and whitening cleansers. I wan to buy a small little fridge and put in my room to store all my masks. My mum has been nagging at me because part of her fridge is currently occupied by all masks , ampoules etc. Been out in the sun for photoshoots and totally sun burnt. Need to tone back my skin again ! This entry was posted in Cel-derma, Korean beauty and tagged Cel-derma, Korean beauty.